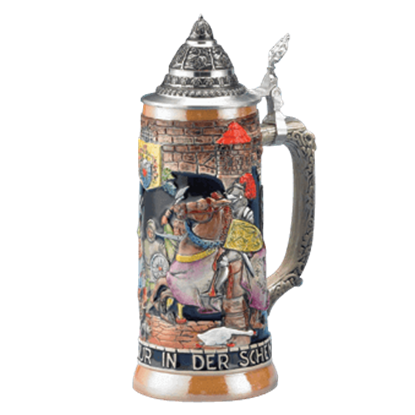 The Albrecht Durer Beer Stein is crafted from pewter and features a raised-relief decoration. The body design consists of four subject panels depicting works by this famous Renaissance painter and engraver. 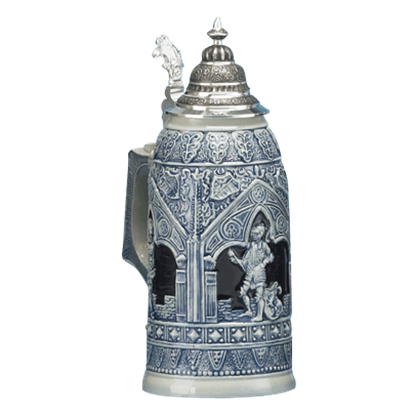 This beautiful stein was inspired by a 100 year old Thewalt and Paulus antique that exhibited a three-domed design. 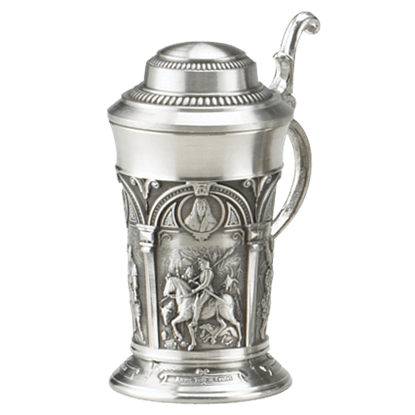 In this Antique Knight Stein, that inspiration is given a resurrection to create an impressive and detailed display piece. Displaying a traditional theatre scene in raised relief, this German stoneware stein is hand painted in antique style colors. The Antique Theatre Stein depicts men and women in medieval clothing, gathered for an open air performance. Three cast pewter angel heads with gold-leaf wings are applied along the flared base of the Archangel Michael Beer Stein. On the pewter lid, Michael the Archangel appears in full armor with golden wings, sword, and shield. 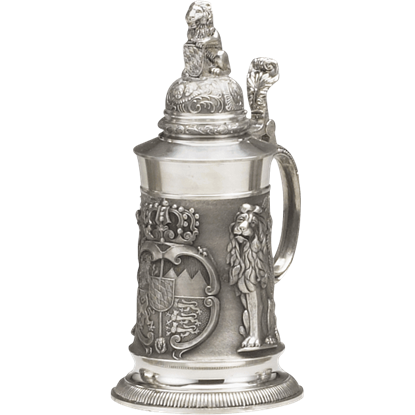 This Bavarian Lion Stein displays three proud lions guarding the coat of arms of Bavaria. On either side of the crown and shield emblem we find the majestic animal in deep relief. 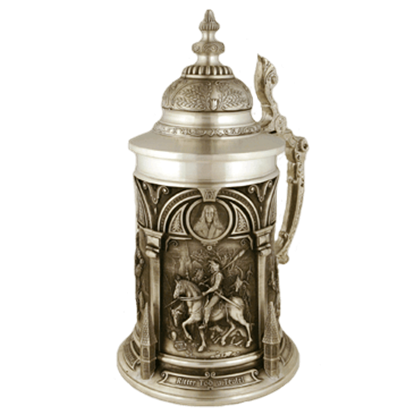 This collectible stein is made from fine pewter. 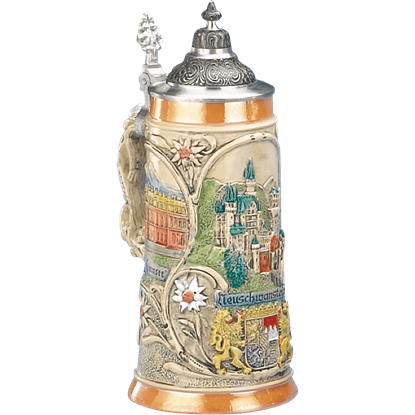 The Bayern Traditional Stein features a Bayern crest in the center, supported by two lions. A banner above the crest reads Gott Mit Du Land Der Bayern (God be with you, land of Bavaria), and below the crest, it says simply Bayern. 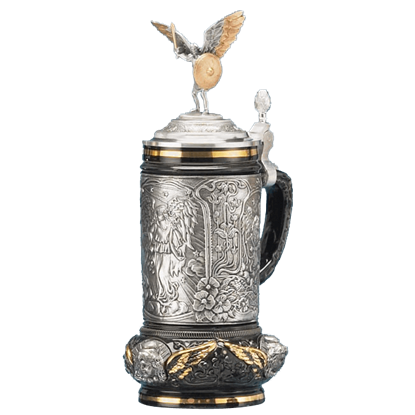 A raised relief pewter version of the Prussian eagle is the focal point of this stoneware stein. 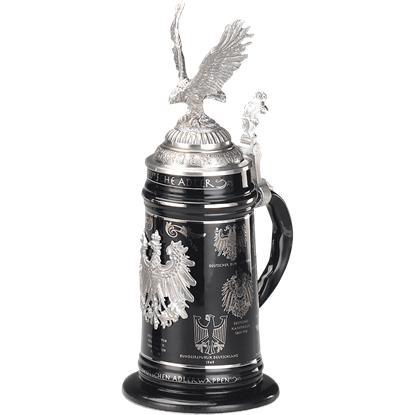 Wrapped around the Black Heraldic Eagle Stein is a decal of the history of the German eagle from 300 A.D., condensed into fifteen panels. 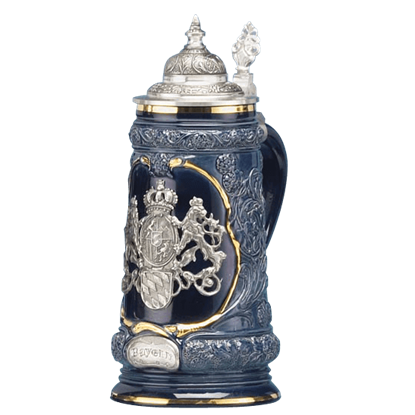 The stein is painted in Bavarian blue and gold. 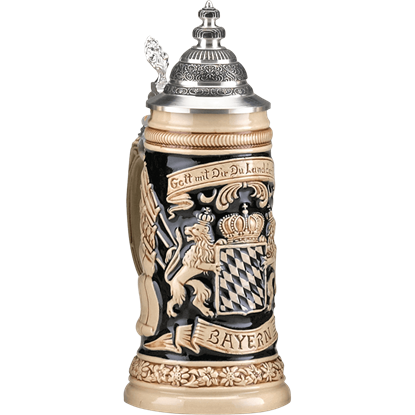 A pewter coat of arms medallion rests opposite the handle with a Bayern name plate beneath it. 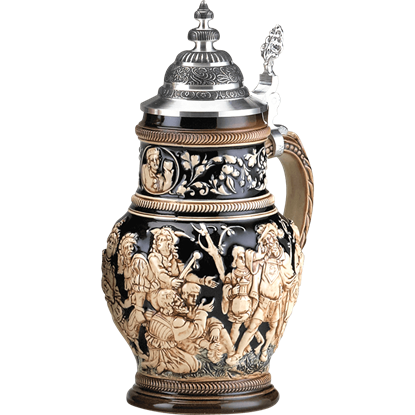 An ornamental pewter lid completes the stein. It is made of stoneware. The Castle Gate Stein is decorated as a stone castle tower. On the front of the stein, opposite the handle, two doors open on the sides to reveal a man in historic apparel valiantly waving a flag with a castle in the background. Steins are not just impressive cups to enjoy drinks out of. Some, like this Castle Tower Stein, are as much a work of art as they are an addition to your feasting table, and that makes them a multi-use addition to your medieval setting! The Castles of King Ludwig Stein depicts the three castles commissioned by Ludwig II of Bavaria, Neuschwanstein, Linderhof, and Herrenchiemsee. 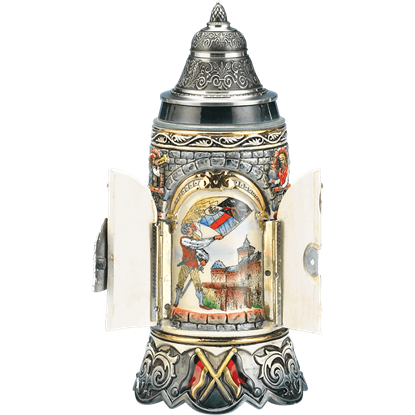 The collectible stein also displays edelweiss flowers and the Bavarian coat of arms.